At our Februray 20th meeting we had a great presentation by Leroy Williamson on Caddo Lake. 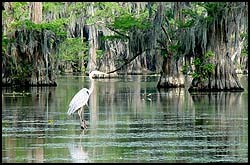 It was filled with great photos of Caddo Lake and its wild life! The CTPC would like to thank Mr. Williamson for coming and sharing with us! Our next meeting is March 20th. It will be a photograhic program by Dr. Keith Thompson on "cruising down the Danube" which is digital. Here's one for all the digital gurus out there!